We can’t all be Caesar! Well, wait a second… maybe we can. With a Gold Caesar Circlet, it’s pretty easy to at least feel like a Roman Emperor. Hopefully you’ll run more toward the Augustus side than Caligula or Nero, but hey, we hear they threw great parties! If you can’t tell, it’s not a bracelet (unless you’re the Hulk). No, this circlet is a golden crown, meant to resemble a laurel wreath which symbolized victory in war to the ancient Romans. You can be a Roman general returning in triumph after a battle in Gaul or Asia Minor, a gladiator who’s won his freedom at the Colosseum, or an early Olympic athlete in this Gold Caesar Circlet. It’s a perfect accessory for any Greek- or Roman-style costume, or a decadent addition to any look really. We can certainly imagine Kanye wearing it with red leather or oversized sweats more than a toga. 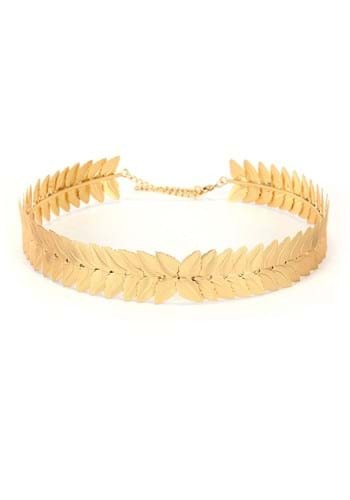 If you have the ego of an emperor, this Gold Caesar Circlet will communicate it to the world for you so you don’t have to be so commanding.